Subscribe now and receive our range of Special Supplements FREE of CHARGE. Our popular Container Crane & Components Supplement features articles related to purchasing and maintaining container cranes and associated issues; a complete breakdown of cranes on order, with full specification; and an extensive news section with the latest (technological) development in components. 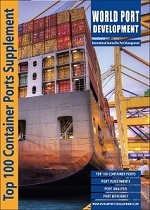 Due to overwhelming demand the Top 100 Container Port Supplement 2017 is available for purchase on an individual basis for 165 UK pounds (including postage & packaging). The Latin America Ports Supplement brings you up-to-date with the latest dredging and port construction projects from this important growth market. The Supplement gives you an insight - by country - how both port authorities and terminal operators have responded to the global economic downturn, their actions and solutions.